My kids are kind, smart, funny, lovely, and polite (generally). But they are not helpful around the house. Like, at all. I know that this is a common problem, but I feel like other parents have a better handle on it. I haven’t done a great job training them to clean up their own messes, much less do the laundry. I am certainly no example for tidy living, as they shift piles of papers on the table to eat their lunch. But when they drop their coats on the floor where they stand or leave the Barbie paraphernalia scattered on the floor that I just cleaned up, a little part of my brain explodes. 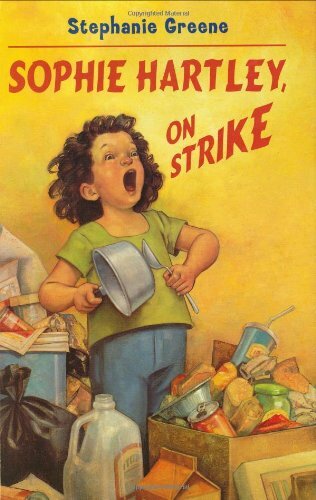 Enter the book Sophie Hartley On Strike, by Stephanie Greene. Sophie complains that she is stuck with the chores when her teenage brother heads to a game and her sister sleeps in late. Sophie’s mother, tired of taking care of all of the household, decides to make a job list for everybody. Thad, Nora, and Sophie are supposed to rotate the chores among themselves. John, at six, gets his own chores, like picking up dead bugs or escorting live ones outside. Baby Maura is excused from helping. The family squabbles and argues, and eventually the girls go on strike saying that the boys aren’t doing their fair share. The story doesn’t break any hugely inventive ground, but the family dynamics and Sophie’s interactions with her friends are realistic and amusing. Sophie’s not as much a “character” as some of the girls we’ve been seeing these days in kids’ lit  Junie B., Judy Moody, Clementine  which works well in this book because she seems just like every kid. Ohmigod, how many times have I made that speech? I was very hopeful in reading this book that I would find a solution to my my own household chore problem, but the ending doesn’t really go anywhere. They all decide that the list is too restrictive, but that everyone should help out more. Yeah. Good luck with that. Still, a fun and good book for early elementary school readers.